These four-way PVC tees will fit sch 40, Sch 80, Class 200, Class 315, co-extruded furniture pipe and any other IPS size PVC pipe, plumbing grade or furniture grade. If you want to use the 1/2" and 3/4" four-way pipe fittings (which are all referred to as IPS or Sch 40 fittings) with CTS (the cream color CPvC pipe) you can use CPVC CTS to PVC IPS adapters. Some 4-way PVC fittings are MADE IN THE USA, some are imported. NEW! 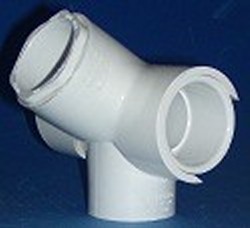 1.25" 30° 4 ways, "pvc side outlet 30° T's." This is the fitting you need to create a canopy or other sloping top structure. Creates a slope of 30° from the horizon. Actual angle is 120?which means it can also be used for the peak. Slip all four ways. Used for many construction projects. NOT a NSF rated fitting, cannot be used on projects that require plumbing inspections. Not a flow through fitting. Just for construction projects. For each "rung" of your canopy, you will need 3 of these. If you have a square canopy you will need 6 total. For a 3 "rung" rectangular canopy, you'd need 9. Works with Sch 40, Sch 80, Class 200 pipe. Suggested spacing is 4' with sch 40, 5' with sch 80 and 3' with class 200 for horizontal members. You can also use the 1.25" Side Outlet 120° Wyes with this fitting for the roof peak ends.